Easy, it is not. But almost done (twice: by ChewieLewis and by myselft). Thank you for your interest in this project. Iâ€™m still actively working on it (I found and scanned 35mm cells for each subtitle, so that I can now rotoscope those â€œoriginalâ€� subtitles instead of trying to make new ones). Since then, I rebooted my project from scratch and I currently use BD as my main source (which is far less cropped than HDTV and ChewieLewisâ€™ reconstruction). And Blutopia is overly strict even for a private tracker. Iâ€™d be surprised if my account hasnâ€™t been deactivated from disuse by now, honestly. You must seed uninterrupted for 14 days after snatching something, with very limited leeway for downtime, and VPN use is prohibited entirely? Come on, guys, I have one laptop that I take back and forth to and from work, and I canâ€™t exactly seed from work, and certainly not without a VPN if I even wanted to risk it. The OP says that there is an update on 19th Jan 2018. Isnâ€™t it 2019? Interisting! I didnâ€™t notice, since this scene is not in the theatrical version. But Iâ€™m not sure: the theatrical scene has more depth than the BR re-rendered scene. Furthermore, other scenes would have also deserved a new rendering for 3D (final battle in space, pod race) but yet they have not been re-rendered. Anyway, youâ€™re right: it would be great to have that released on bluray one day. As you can see, some ships are in the same place, some are not, some are addedâ€¦ Obviously, the entire scene was rerendered for the Blu-Ray (possibly for the same reason than adding a bridge near the Palace of Theedâ€¦). Iâ€™ll add grain (using a proper original grain scanned in 4K) at the end of the process. It seems that they are available on yggtorrent. AFAIK, Caravan of Courage was released on Blu-Ray. JEDIT: it seems that it is a bootleg. No it is not a deleted/extended scene, it is your weird extrapolation based on a photo taken from a storybook (hold by a Smurf). Could you please discuss about this storybook in the topic dedicated to it ? OK, so this is definitely off topic. If you look at the planet scrolling Surface once we See the X-wings Heading Towards Camera the Correct Scrolling Surface is Used for the Orange Planet Yavin. Instead of Reversing the Scrolling Texture they Decided to use this Scroll instead perhaps because it was rotating in the right direction for the effect of passing the planet. It was Actually created for the Alderaan part of the film. Ok the orierntation is correct in the Image the Planet Scrolls toward the Horizonâ€¦ The Star Field Moves left to Right and the Death Star can Move and pivot as a footage Matte or 2D image element. This would create a 3D effect using 2D elements so as to simulate the Death Star in Orbit. 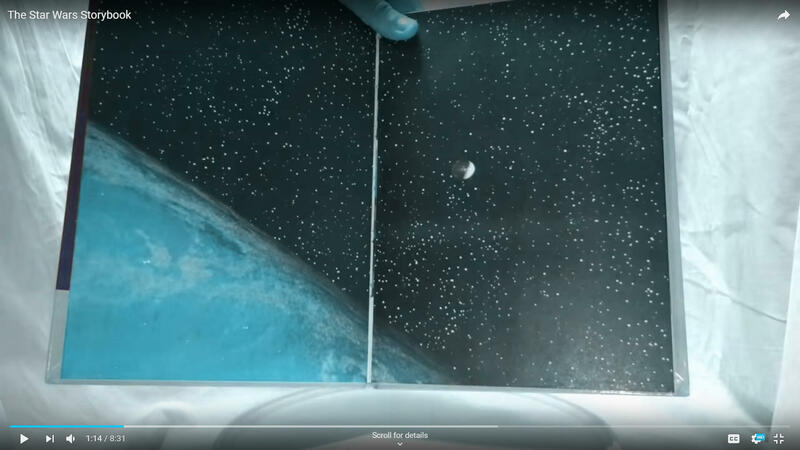 This would Mean that That when seeing Alderaan out the Viewscreen on The Death Star it would have been either Stationary (Most Likely) or come in from the left to the center of the screen. Congrats and welcome to BabyDre! You need to properly calibrate your story book.